(Bloomberg) -- All-male boards at the U.K.’s biggest companies are nearing extinction, a sign that government efforts to increase gender parity are paying off. Those bucking the trend include hospitality group Millennium & Copthorne Hotels Plc, property business Daejan Holdings Plc and two investment trusts. Daejan cited its orthodox Jewish owners as the reason for the lack of senior women. “Unless somebody forces us to do anything different, the chances of us appointing a woman are pretty slim,” said Mark Jenner, Daejan’s secretary. 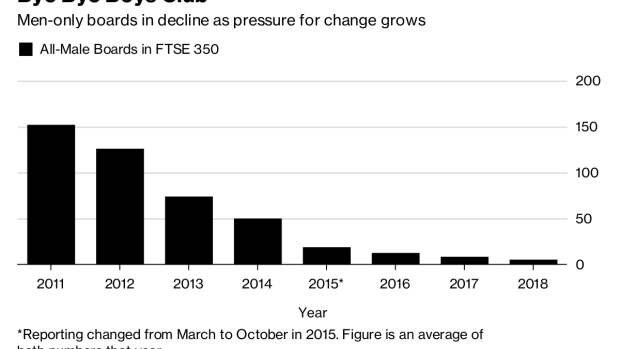 Those working on the review were cheered by how many of last year’s transgressors became more diverse, with companies such as Sports Direct International Plc and Euromoney Institutional Investor Plc coming off the list. But they still faced some disappointing excuses from companies as to why there weren’t more women on boards. Companies have explained the absence of women on their boards by saying “they don’t fit in,” “they don’t want the hassle,” and “all the good ones have already gone,” according to comments heard by the Hampton-Alexander Review authors that were published in May by the U.K. Department for Business, Energy & Industrial Strategy. For all the progress on boards, the number of female CEOs among the FTSE 100 remained at six for the third year in a row. Moya Greene stepped down as CEO from Royal Mail Plc in June and Carolyn McCall was replaced by a man at easyJet Plc. Disparities also remain on pay. The U.K.’s Equal Pay Day on Saturday marked the point in the year corresponding with the average gender pay gap, after which women’s work can be seen as unpaid. The U.K. has made a big push in recent years to boost equality for women in the workplace. A new law introduced in April forcing all companies with at least 250 employees to report average differences between men’s and women’s pay has increased transparency. The pay gap shrunk from 18.6 percent last year to 17.9 percent in 2018, the U.K. Office for National Statistics reported last month. Those efforts have been buoyed over the last year by the #metoo movement, a call to arms for women to speak out about experiences of sexism and sexual harassment in the wake of allegations against Hollywood mogul Harvey Weinstein. About 79 percent of European companies made changes to improve their responses and training around sexual harassment following the Weinstein scandal, according to U.S. employment law firm Littler Mendelson P.C. Some of the 800 executives, HR and legal professionals the firm surveyed said their employers had re-examined old cases. Government has also been scrutinized. Britain hosted the first-ever conference for female parliamentarians from around the world last week to mark the 100th anniversary of women winning the right to stand for election in the country. Women currently make up 32 percent of U.K. lawmakers, compared with 24 percent of those in elected office globally, according to government data.